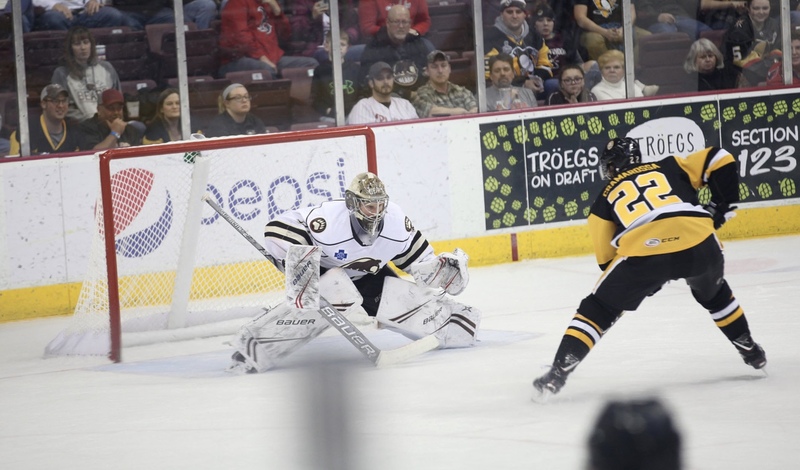 The American Hockey League announced today that goaltender Vitek Vanecek of the Hershey Bears has been selected to play for the Atlantic Division in the 2019 Lexus AHL All-Star Classic presented by MGM Springfield on Jan. 27-28 in Springfield, Massachusetts. This marks Vanecek’s first All-Star Classic selection. Complete rosters for the 2019 Lexus AHL All-Star Classic presented by MGM Springfield are AVAILABLE HERE. Vanecek, 22, ranks eighth in the AHL with a 2.55 goals against average this season. He has collected a 7-7-2 record this year, posting a .909 save percentage and one shutout. The native of Havlickuv Brod, Czech Republic has allowed two or less goals in nine of his 16 starts this year. He posted a career-high 40 saves in Hershey’s win at Wilkes-Barre/Scranton on Oct. 17, and was named the CCM/AHL Player of the Week for the period ending Oct. 21. In that span, Vanecek posted a 2-0-1 record with a 1.62 goals against average and a .949 save percentage on the week, stopping 94 of 99 shots in three road starts. Vanecek was selected in the second round, 39th overall, by the Washington Capitals in the 2014 NHL Draft. After posting a 2.03 goals against average and landing on the ECHL All-Rookie Team with the South Carolina Stingrays in 2015-16, Vanecek collected a win in his first AHL start for the Bears on Apr. 17, 2016, beating Wilkes-Barre/Scranton, 2-1, in a shootout. He joined the Bears full-time for the 2016-17 campaign, and in total, has appeared in 88 career games with Hershey, going 38-30-11 with a 2.70 goals against average, .902 save percentage, and eight shutouts. The 2019 Lexus AHL All-Star Classic presented by MGM Springfield will include the AHL All-Star Skills Competition on Sunday, Jan. 27, followed by the AHL Hall of Fame Induction and Awards Ceremony on Monday, Jan. 28, with the 2019 AHL All-Star Challenge taking place that evening. The All-Star Challenge consists of a round-robin, 3-on-3 tournament pitting the four AHL divisions against one another. This entry was posted in News and tagged Herhsey Bears, Vitek Vanecek. Bookmark the permalink.